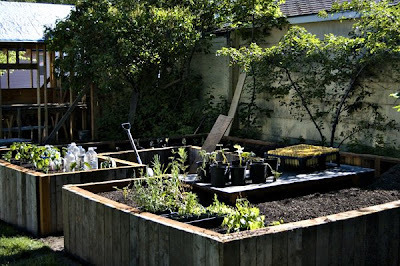 A Taste of the Earth: raised bed: got dirt? or exposure? Due to resourceful dirt-gathering round his house and the neighborhood as well as some questionable estimations of what a cubic yard is (by the friendly dozer drivers at ekocompost), the handyman is almost done with his prized raised bed. You can't tell in the photo, but the side of the bed closest to his neighbor's garage needs a little more dirt. No matter though. There are tomatoes and squashes and cabbage and peppers that don't seem to care that the bed they're in is slightly unmade. I know I should include some better pictures at different angles... It's a little embarassing since I've owned my camera for... um... a while. I'll admit, today was my first day to shoot in manual mode and actually have any clue about what I was doing. Not that a clue helped me get a good picture, but I was concentrating so hard on those pesky settings that I forgot to take more pics... Okay, okay, you got me. I got frustrated and said to heck with it. It's going to get worse before it gets better, but I've got a good coach (sometimes it's annoying just how handy that handyman is... I adore him anyway). Just in case you're curious, that raised bed holds somewhere around 5 cubic yards of golden brown stuff. They are beautiful! Can't wait to see your harvest! Wow...that's a pretty fancy raised bed you got there. Kuddos to the Handyman for all his hard work!!! This has inspired me to get my own hands a little dirty and plant a container herb garden...not quite as ambitious, but I've got to hone my burgeoning green thumb somewhere. Nice deep beds. There should be plenty of room for a big harvest. Mine are shorter so I have a lot of bending over to do. I like these. Lovely :) We hauled in about 5 cubic feet as well to our back yard, so I know how fun that is, lol. Can't wait to see everything in full bloom! Don't worry about the camera - all the pics will be great.